Local Pelotonia committee members shown are Matt Pettit, Linda Hansen, Milan Hansen, David DaRif, Leslie DaRif, Angie Curtis, Cheryl Fisher and Mark Fisher. Not shown are committee members Jane and Don Pope, Susan Eckles and Kelli Chambers. Peloton: a name given to the main field of riders in a road race. “Pelotonia” is a grass-roots movement that funds life-saving cancer research. It was founded in 2008. Pelotonia is a three-day experience of cycling, entertainment and volunteerism. Through its first eight rides, Pelotonia raised more than $130 million. Due to its generous funding partners: Huntington Bank, L. Brands Foundation, Peggy and Richard Santulli, American Electric Power Foundation, Nationwide Insurance, Cardinal Health Foundation, and the Harold C. Schott Foundation, Pelotonia is able to direct 100 percent of every rider-raised dollar to cancer research at The Ohio State University Comprehensive Cancer Center-James Cancer Hospital and Solove Research Institute. This Saturday, July 15, Streetside 62 and the classic rock band, Dumbfounded, are sponsoring the 2017 Pelotonia Benefit, from 5-10 p.m. All money raised that night will be matched 100 percent. There will be a live and a silent auction as well as a 50/50 raffle. Streetside 62 will donate $3 to Pelotonia for every meal served and $1 for all drinks. 1. The Miracle Pill. Clinical trials funded by Pelotonia money led to FDA approval of Ibrutinib, which is a pill that is saving the lives of people with chronic lymphocytic leukemia. The pill does not cure CLL but allows people to live with their disease. 2. The Initiative. Pelotonia funded a state-wide initiative aimed at identifying those at high risk for colotrectal, ovarian and uterine cancer so they can seek preventative care. 3. The Inhibitor. A Pelotonia Idea Grant identified a genetic mutation, FGFR, that leads to the growth of cancer cells and clinical trials for an inhibitor are currently underway. Instead of looking at lung or breast cancer, doctors could be classifying a cancer by its genetic mutation. 4. The Cancer Killer. Clinical trials of a protein (CT-011) are underway. The protein seems to help the body detect and target cancer cells. 5. The Protein. PTEN is a natural tumor suppressing protein found in the body. Researchers are investigating how PTEN impacts women with breast cancer. These last two impact items would be sitting on a shelf somewhere if not for Pelotonia funding. In just eight short years, this is the impact this grassroots movement is having on cancer research. If you have been touched by cancer, please consider coming to support this cause. For more information about Pelotonia or to sponsor one of the local cyclists, visit the Columbus Pelotonia website. 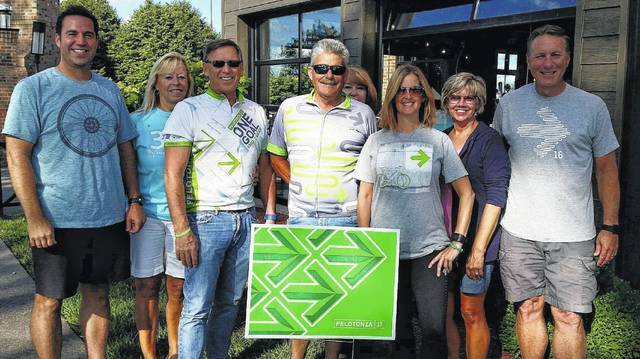 https://www.recordherald.com/wp-content/uploads/sites/27/2017/07/web1_2017062795.jpgLocal Pelotonia committee members shown are Matt Pettit, Linda Hansen, Milan Hansen, David DaRif, Leslie DaRif, Angie Curtis, Cheryl Fisher and Mark Fisher. Not shown are committee members Jane and Don Pope, Susan Eckles and Kelli Chambers.